For the rental car company, see Budget Rent a Car. For the car insurance company Budget, see Budget Group of Companies. To communicate plans to various responsibility center managers. To motivate managers to strive to achieve budget goals. Tools provide a forecast of revenues and expenditures, that is, construct a model of how a business might perform financially if certain strategies, events and plans are carried out. Tools enable the actual financial operation of the business to be measured against the forecast. Lastly, tools establish the cost constraint for a project, program, or operation. If the actual figures delivered through the budget period come close to the budget, this suggests that the managers understand their business and have been successfully driving it in the intended direction. On the other hand, if the figures diverge wildly from the budget, this sends an 'out of control' signal, and the share price could suffer. Campaign planners incur two types of cost in any campaign: the first is the cost of human resource necessary to plan and execute the campaign. the second type of expense that campaign planners incur is the hard cost of the campaign itself. A budget is a fundamental tool for an event director to predict with a reasonable accuracy whether the event will result in a profit, a loss or will break-even. A budget can also be used as a pricing tool. There are two basic approaches or philosophies, when it comes to budgeting. One approach is telling you on mathematical models, and the other on people. The first school of thought believes that financial models, if properly constructed, can be used to predict the future. The focus is on variables, inputs and outputs, drivers and the like. Investments of time and money are devoted to perfecting these models, which are typically held in some type of financial spreadsheet application. The other school of thought holds that it’s not about models, it’s about people. No matter how sophisticated models can get, the best information comes from the people in the business. The focus is therefore in engaging the managers in the business more fully in the budget process, and building accountability for the results. The companies that adhere to this approach have their managers develop their own budgets. While many companies would say that they do both, in reality the investment of time and money falls squarely in one approach or the other. For more details on this topic, see Government budget. The budget is prepared by the Treasury team led by the Chancellor of the Exchequer and is presented to Parliament by the Chancellor of the Exchequer on Budget Day. It is customary for the Chancellor to stand on the steps of Number 11 Downing Street with his or her team for the media to get photographic shots of the Red Box, immediately prior to them going to the House of Commons. Once presented in the House of Commons it is debated and then voted on. Minor changes may be made however with the budget being written and presented by the party with the majority in the House of Commons (the Government), the Whips will ensure that is it passed as written by the Chancellor. The federal budget is prepared by the Office of Management and Budget, and submitted to Congress for consideration. Invariably, Congress makes many and substantial changes. Nearly all American states are required to have balanced budgets, but the federal government is allowed to run deficits. The Philippine budget is considered the most complicated in the world, incorporating multiple approaches in one single budget system: line-item (budget execution), performance (budget accountability), and zero-based budgeting. The Department of Budget and Management (DBM) prepares the National Expenditure Program and forwards it to the Committee on Appropriations of the House of Representative to come up with a General Appropriations Bill (GAB). The GAB will go through budget deliberations and voting; the same process occurs when the GAB is transmitted to the Philippine Senate. After both houses of Congress approves the GAB, the President signs the bill into a General Appropriations Act (GAA); also, the President may opt to veto the GAB and have it returned to the legislative branch or leave the bill unsigned for 30 days and lapse into law. There are two types of budget bill veto: the line-item veto and the veto of the whole budget. In a personal or family budget all sources of income (inflows) are identified and expenses (outflows) are planned with the intent of matching outflows to inflows (making ends meet). 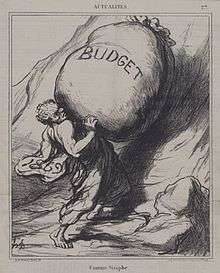 In consumer theory, the equation restricting an individual or household to spend no more than its total resources is often called the budget constraint. Elements of a personal or family budget usually include, fixed expenses, monthly payments, insurance, entertainment, and savings. There are many informational sites and software available for use in personal and family budgeting. Capital budget - used to determine whether an organization's long-term investments such as new machinery, replacement machinery, new plants, new products, and research development projects are worth pursuing. Cash flow/cash budget – a prediction of future cash receipts and expenditures for a particular time period. It usually covers a period in the short-term future. The cash flow budget helps the business determine when income will be sufficient to cover expenses and when the company will need to seek outside financing. Expenditure budget – includes spending data items. ↑ "CIMA Official Terminilogy" (PDF). ↑ O'Sullivan, Arthur; Sheffrin, Steven M. (2003). Economics: Principles in Action. Upper Saddle River, New Jersey 07458: Pearson Prentice Hall. p. 502. ISBN 0-13-063085-3.